While African-American and Latino males in New York City showed significant improvement in their high school graduation rates during the last decade, they demonstrated strikingly low college readiness rates, according to a just-released study. “Among students scheduled to graduate in 2010, only 9 percent of Black males and approximately 11 percent of Latino males graduated [from high school] ‘college ready,’” reports Moving the Needle Exploring Key Levers to Boost College Readiness Among Black and Latino Males in New York City, which was published by the New York University-based Research Alliance for New York City Schools research group. The study noted that nationally only 26 percent of Black males and 18 percent of Latino males attain an associate degree or higher, compared to 41 percent of students overall. Dr. Adriana Villavicenio, a study co-author and Research Alliance for New York City Schools research associate, says the study was undertaken to help New York City educators, city officials, philanthropists and others better understand the educational challenges that lie ahead nearly two years after the launch of Mayor Michael Bloomberg’s ‘Young Men’s Initiative’ to address “the broad disparities slowing the advancement of Black and Latino young men.” The study documents college-related outcomes and other indicators that help predict college readiness for Black and Latino male students, and outlines key related factors that underlie the educational outcomes. Under the broad-based efforts of the Young Men’s Initiative, the city in 2012 started the Expanded Success Initiative (ESI), a program to improve college readiness and career outcomes for Black and Latino males. NYU’s Research Alliance group was chosen to evaluate ESI, which is now providing assistance to 40 city high schools to help improve college and career readiness among Black and Latino male students. “The Expanded Success Initiative is a cornerstone of our work to provide Black and Latino students with the support and resources they need to excel in high school and beyond,” Bloomberg said in a statement. Villavicencio says that, while it was too early to evaluate ESI this past spring and early summer, the Moving the Needle study was produced to define “the context of college readiness” and the challenge it presents for NYC educators. 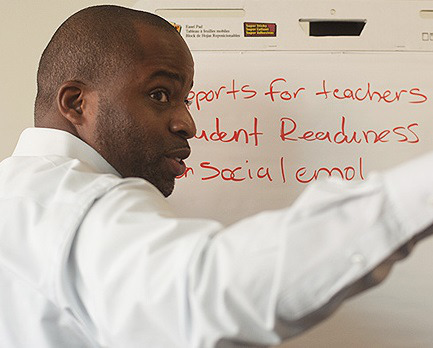 “ESI is really focused on college and career readiness of Black and Latino males. And we thought it would be important to ask what does that look like in New York City,” she explains. The study highlights suggested policies and practices ESI schools can follow to help their Black and Latino males overcome academic and social challenges. Among the suggested practices are school staff members having an explicit focus on college readiness in their communications to students, investing in resources in the ninth-grade to strengthen college awareness and planning, increasing opportunities for rigorous coursework, and training school staff in culturally responsive education methodology. Villavicencio says the Research Alliance group should begin producing evaluation reports as early as December this year that will indicate whether ESI practices are having any impact on Black and Latino male students. “It’s too early now to have definitive ideas on what practices will have the most impact on the young men that ESI targets,” she says.